What sets this book apart is its incredible design and Blackall’s attention to details. The moment I picked it up earlier this year I was immediately struck by the shape and feel of the book and how it mimics the tall narrow lighthouse. Yet, inside, Blackall uses circular patterns to illuminate the circular nature of the structure, the cycles of life and the passing of time. The covers are attention grabbing, and the title placement hints at the circular motifs to be found inside, peeking under the dust jackets will reveal even more detail. The endsheets are designed like the pages of the keeper’s ledger: the front contain information about the lighthouse keeper while the back are Blackall’s Author’s Note. 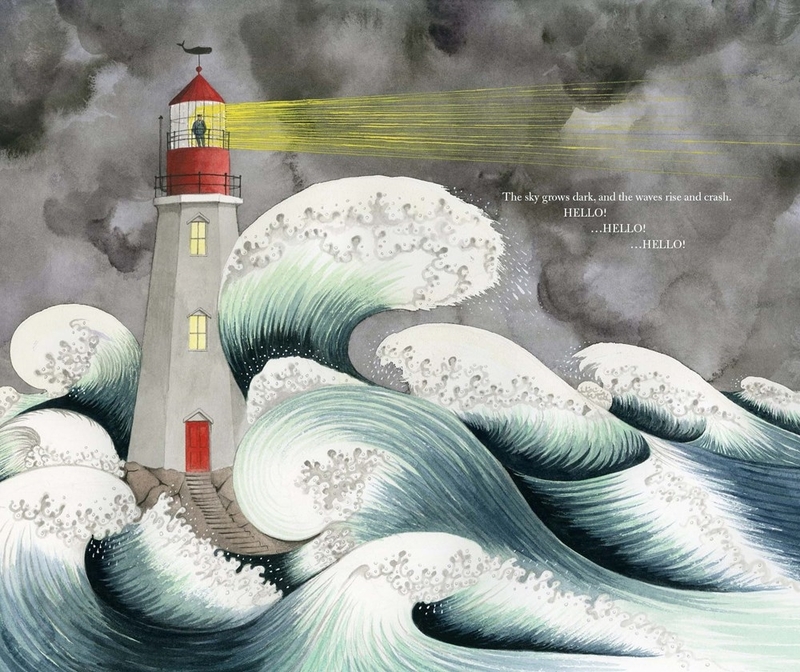 The consistent placement of the lighthouse within the pages showcases the steadfast nature of the structure, especially when shown juxtaposed with crashing waves or dense fog. It is clear the lighthouse stands alone in the ever changing sea. 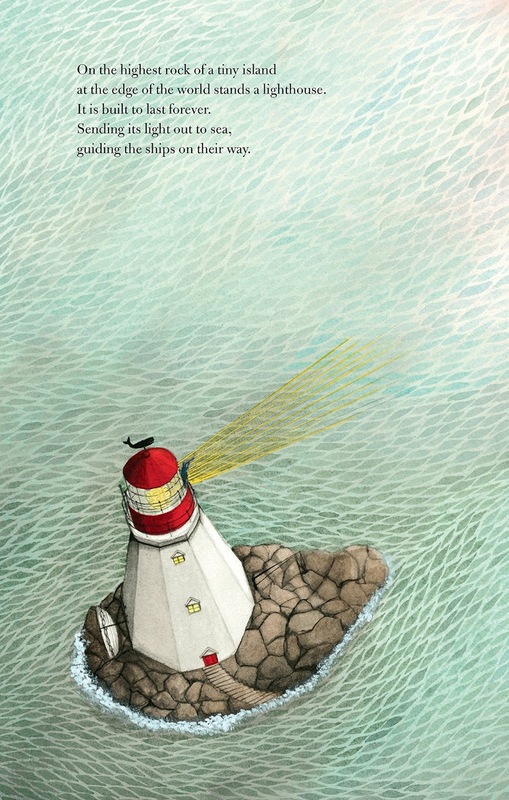 Blackall consistently uses circular framed vignettes within the illustrations–these highlight important features about the keeper’s life and work and also further illustrate the circular nature of the lighthouse itself. Circles abound inside the lighthouse, with decor often based on the shape. The circular motif is reflected outside the lighthouse as well, in whirling gulls and the swirling Aurora Borealis. As this is about change and the passing of time, it is no surprise that the pacing of the book also reflects the cyclical. We see the lighthouse through all four seasons, the keeper, lonely waiting for his wife, the keeper’s wife pacing the floor round with child and the family together as they learn of the future automation of the lighthouse. The consistency with which Blackall showcases the details of this book is truly astounding. I find myself trying to read the keeper’s letters to this wife, which are legible, and am amazed when I find the name of the lighthouse within the pages of the ledger. Every time I look through this book I am struck by new details I am noticing for the first time. Today I noted that when we first see the lighthouse the colors, the color palette, the direction of the light and waves are drawing us to it, like it’s calling to the keeper and the reader. Yet, when we see the family leaving the lighthouse,the light, colors and waves have shifted trajectories, pushing the tender and drawing the eye away as if the lighthouse is really saying farewell. All in all,”Hello Lighthouse” radiates as much warmth as light and will surely be pored over for its lustrous details and touching story. 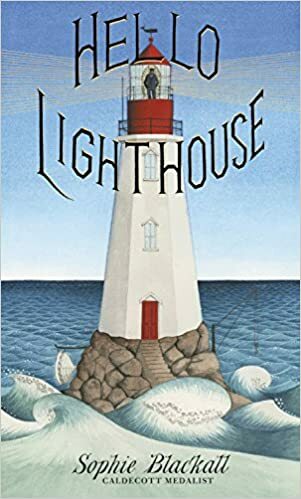 If you think “Hello Lighthouse” is the most distinguished picture book of 2018, be sure to vote for it in this year’s ICPL mock Caldecott! Voting opens on December 1st and will run through January 21st.